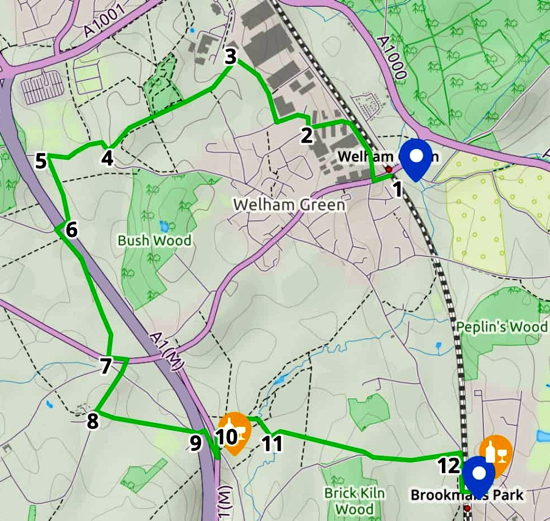 This walks starts at Welham Green station, climbs to a trig point with excellent views to the south and west, drops down to follow the route of the old Dellsome Lane, now reduced to a footpath, passes North Mymms Park, and returns to Brookmans Park via the swallow holes at Water End. 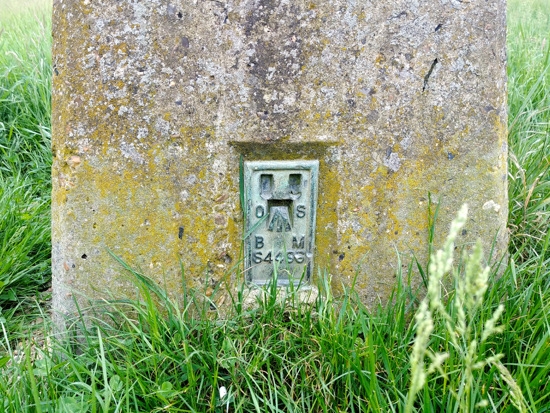 The route covers part of a much longer walk on this site, the 12-mile North Mymms Way. The start and finish points can be reached by bus or train. 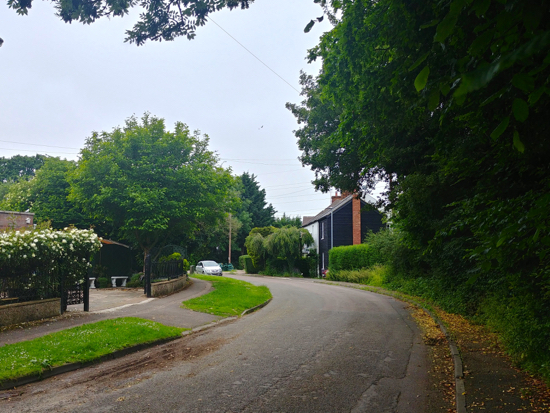 1: From Dixons Hill Road close to Welham Green station, head north along Travellers Lane. The railway track will be on your right. Continue through the industrial estate until you reach Travellers Close on your left. Turn left here and walk west to the end of the close where you can cut through a path to Pooleys Lane. 2: Turn right on Pooleys Lane and follow it round as it first heads north then bends to the left and heads west. Look out for a footpath sign on your right. 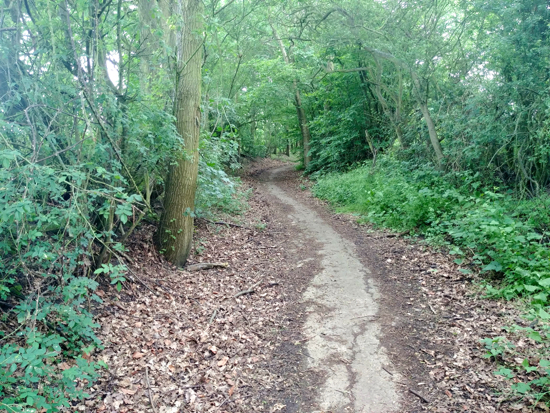 Take this path and head north with the industrial estate on your right and fields and woods on your left. Continue along this path until you reach a footpath on your left just before the path your are on bends to your right. 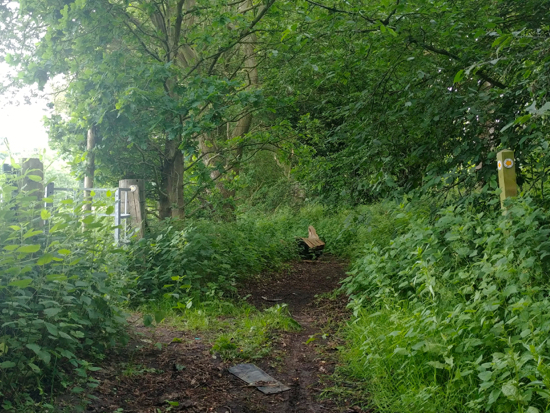 3: Take this path and head west ignoring any other paths to your left and right until you emerge at the edge of a field at a four-way footpath junction, soon after you cross a small wooden footbridge (see image below). There will be a gap in the hedgerow to your left, a path straight on, and one climbing the hill to your right. 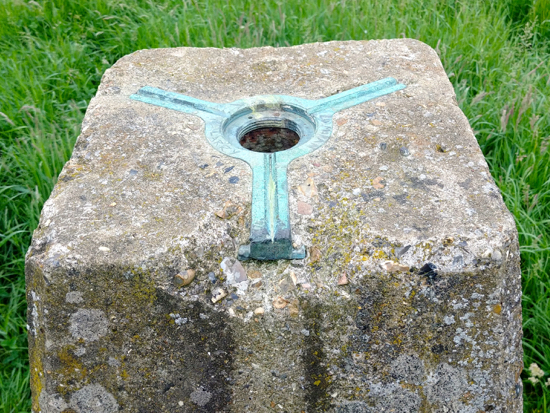 4: Your way is straight on, but, if you want to see the trig point (grid reference TL 22426 06018) it's a short distance up the hill in the field on your right. 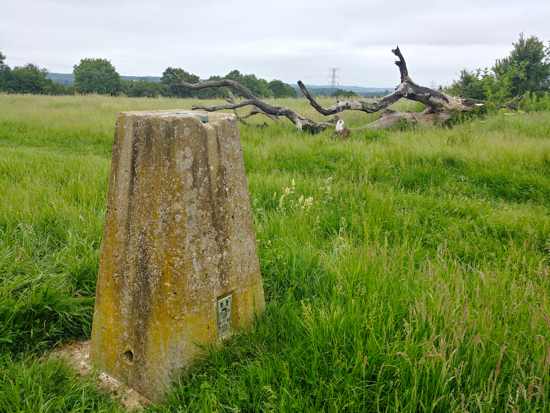 After visiting the trig point, return to the path you were on and continue heading west with the hedgerow on your left and the field on your right. In the distance you will see an electricity pylon. Head in this direction following the path as it dips down to the corner of the field. 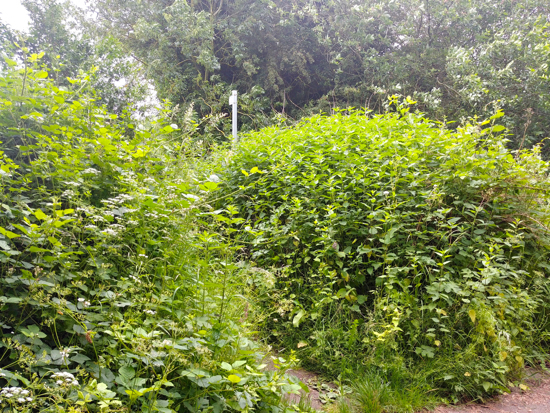 Here the path goes through the hedgerow where it meets another four-way footpath junction. 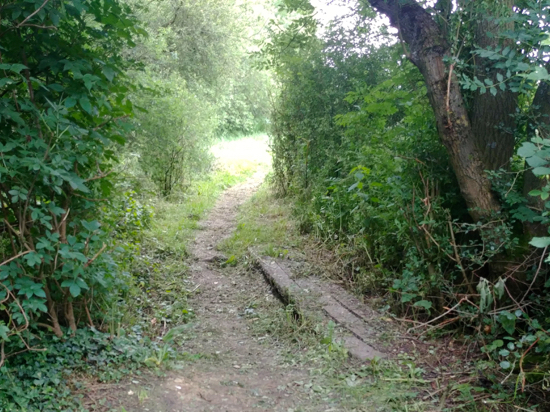 Turn right here (it can be overgrown with nettles), and drop down to the old Dellsome Lane, now a footpath thanks to the A1(M) which, when built, cut across the old road. Turn right and follow the path round as it bends left. Ignore the footpath off to your right. 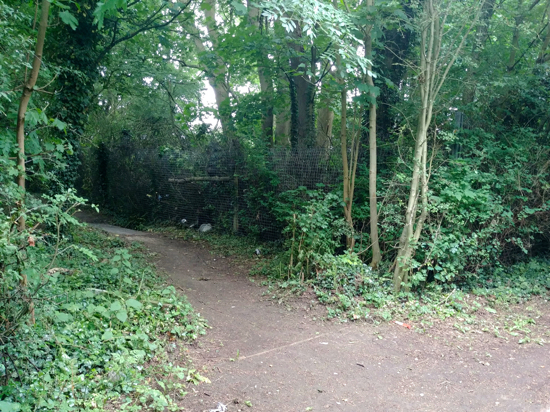 Continue until you reach the end of the Dellsome Lane footpath. You will see a sign pointing to a gate on your left. You are now close to the A1(M). 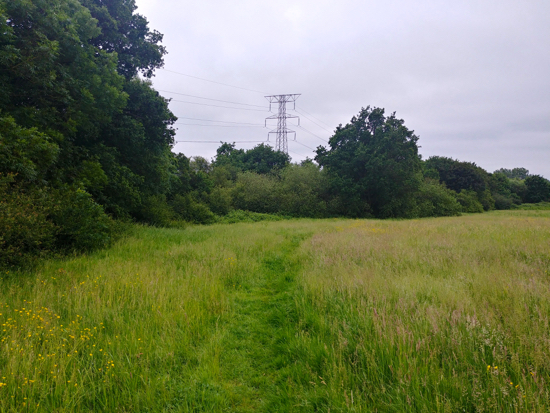 5: Turn left on this path and follow it south through the fields until you reach a bridge over the A1(M). 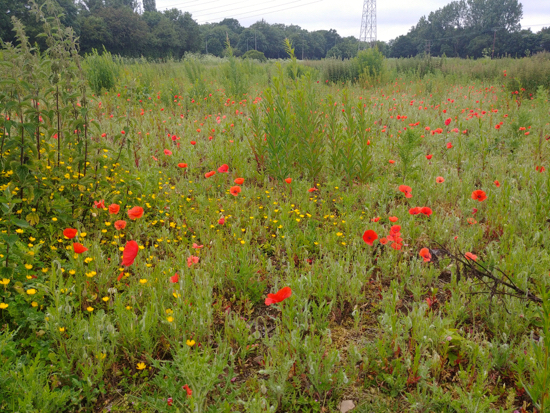 This field is rarely cultivated and the result is that during the summer months it's rich in wild flowers. The poppies are particularly impressive in June (see image at the top of this page). Cross the bridge and, immediately after, take the footpath on your left accessed via wooden stairs. 6: Take this path and head south with the A1(M) on your left and the field on your right. Ignore the first path (soon after the steps) on your right heading west across the field. 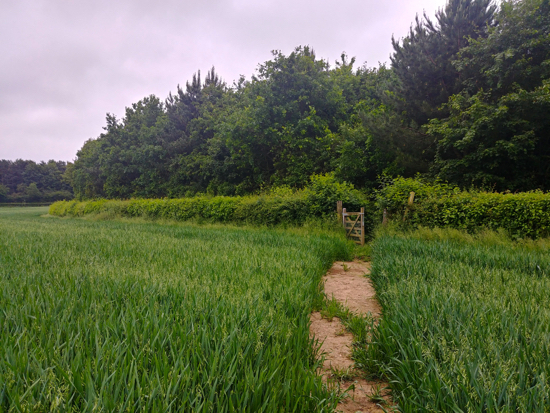 Continue walking south alongside the A1(M) until you see a diagonal path cutting across the crops towards a wooden gate leading into woodland. 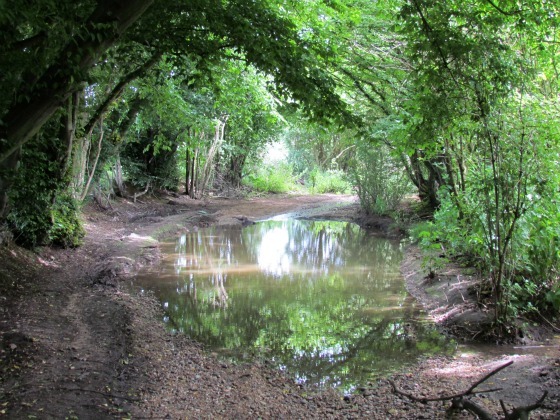 Walk through the woodland and emerge on Tollgate Road close to the Octagon Lodge outside North Mymms Park. 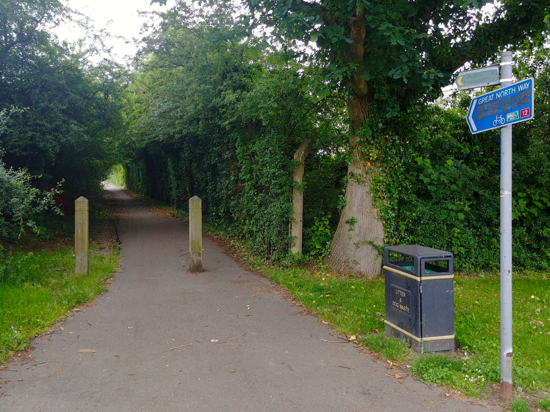 7: Cross Tollgate Road and walk south along St Mary's Church Road, crossing the river and continuing until you reach a footpath on your left just after the turn off to the church. 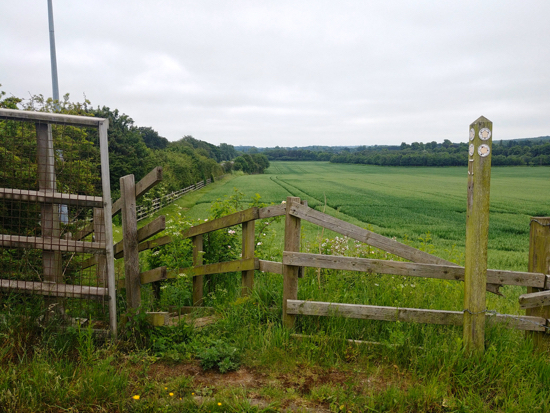 8: Take this footpath and head south-east until you reach the boundary of North Mymms Cricket Club. 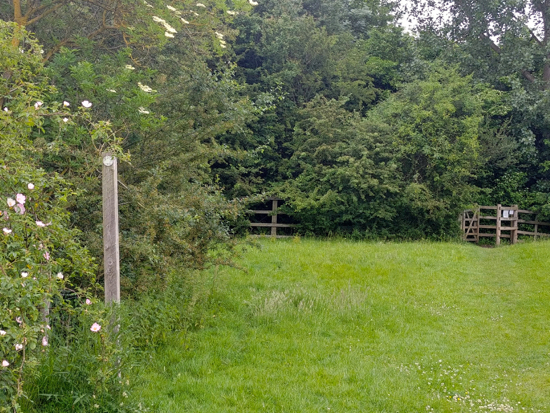 Don't go through the wooden gate at this point because your path heads to the left of that gate, across the field and over to another wooden gate leading through the hedgerow. Turn right once you are through the gate and take the path over the footbridge that crosses the A1(M). Drop down to Swanland Road. 10: Continue on the footpath alongside Swanland Road ignoring the first footpath on your right but taking the second. Follow this path as it heads slightly north-east with the hedgerow on your right and the field on your left. Ignore the paths off to your right and left and continue into the next field, again keeping the field on your left and the hedgerow on your right, heading for the wooden marker post in the far right corner of the field at the point where the path swings round to the left. 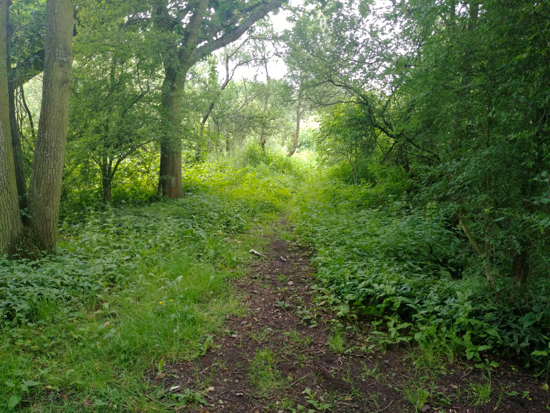 Turn right here and follow the path through the woods and out to the swallow holes before it swings to your left and climbs to an open field. Here you turn right. 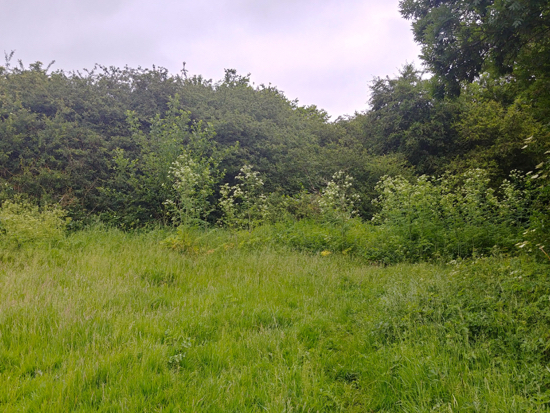 11: At this point you follow the path round to your right with the hedgerow on your right and the field on your left until you reach another marker post. Here your path turns to the left and then bends round to the right still with the hedgerow on your right and the field on your left. 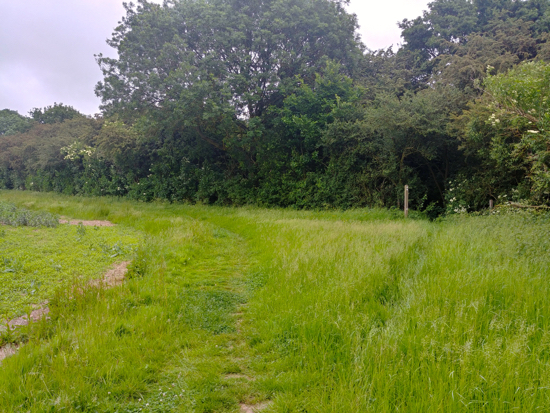 The Ordnance Survey map shows this path going across the field in an easterly direction, but it is rarely maintained and is difficult to find, often ploughed over and covered in crops. 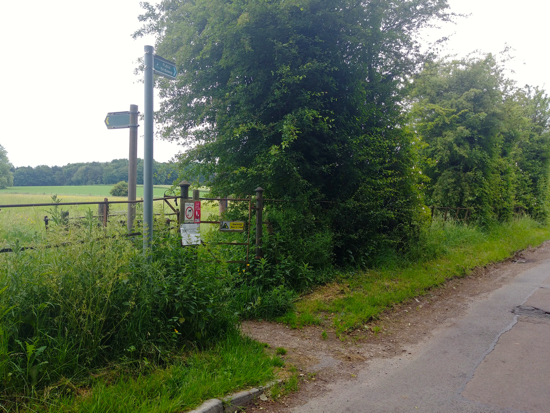 So your best route is the keep heading south, still with the field on your left and the hedgerow on your right until you reach the corner of the field and a path out to Bradmore Lane, where you turn left and follow the lane until it meets Station Road. 12: Turn right on Station Road and follow it round over the railway bridge to Brookmans Park village.